The town of Alcobendas is the home of the first pedestrian bridge printed in 3D. The Institute of Advanced Architecture of Catalonia (IAAC) was in charge of the architectural design of the bridge, which has a total length of 12 meters and a width of 1.75 meters and is printed in micro-reinforced concrete. With this bridge design, the IAAC remains committed to innovation and becoming a global pioneer in large-scale 3D printing. 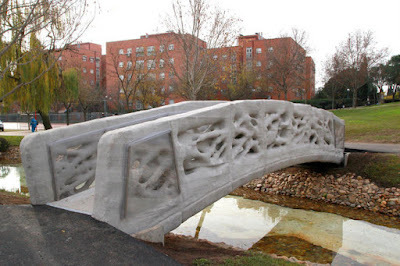 The 3D printed footbridge of Alcobendas, designed with Rhino and Grasshopper, represents a milestone for the construction sector at an international level, since, to date, this technology has not been applied in the field of civil engineering. The 3D printed bridge, which reflects the complexities of nature’s forms, was developed through parametric design, to allow optimizing material distribution and minimizing the waste by recycling the raw material during manufacturing. Thanks to the application of generative algorithms and challenging the traditional construction techniques, the computational design also allowed maximizing the structural performance, with total freedom of forms, maintaining the porosity.